Cassiopeia is operated between Ueno and Sapporo. 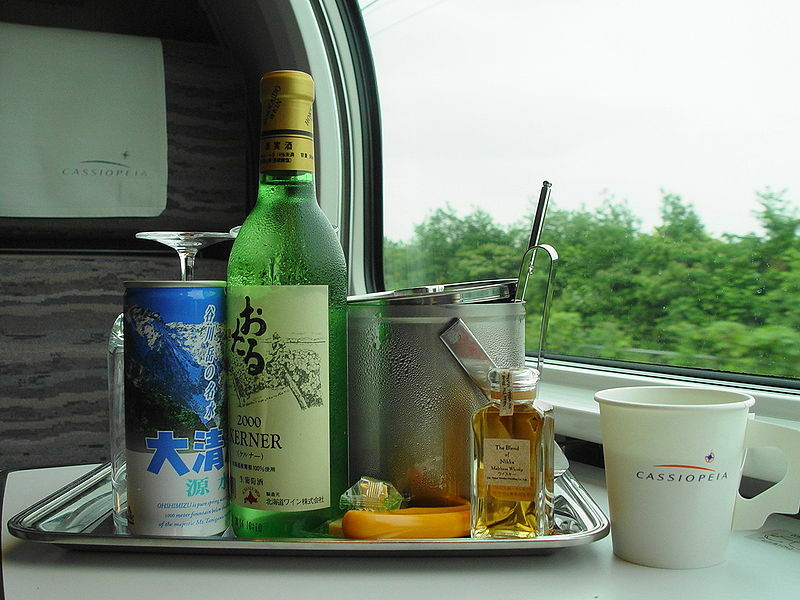 This train is like Japanese version Oriental Express and is the most luxurious in three luxurious overnight trains (other two are Twilight Express and Hokutosei) in Japan. If you want to take this train by Japan Rail Pass, you need to pay some extra charges. You have to pay Limited Express surcharge and the accommodation fee. And also this train goes through non Japan Railway line between Morioka and Aomori. So you have to pay the basic fare for this non Japan Railway line. Even though you have to pay lots of the extra on Japan Rail Pass, many Japan Rail Pass user are interesting in this train. So I tell you that the extra cost, timetable, checking the availability and the types of accommodations. Japan Rail Pass cover only basic fare on Japan Railway. So you have to pay these extra charges. And also you have to pay the accommodation fee. Please see the next chapter. Rate: 25,490 yen per person, based on two persons. There is only one room in the train. This room has a huge glass window. It is so hard to get this room. These following images are facilities. Cassiopeia Suite, Maisonette type has same as these things. There are six rooms in the train. This room is two levels. The first floor is the bedroom and the second floor is the living. The extra bed can be put in the living room and can be used for 3 persons. The extra charge for third person is 13,350 yen. Rate: 17,180 yen per person, based on two persons. There is only one room in the train. This room is one level suite and has a higher ceiling than Cassiopeia Suite maisonette. The sofa can be converted to the extra bed and can be used for 3 persons. The extra charge for third person is 9.540 yen. Rate: 13,350 yen per person, based on two persons. This type of rooms are main stream in this train. This is like a standard twin room. These rooms are in the double decker car. Those rooms are located at the both lower level and higher level. But some of these rooms are located at the single level of this train. A few of these rooms at single level can be used for 3 persons. The extra charge for third person is 9.540 yen. Rate: 22,890 yen per room, based on two persons. *Smoking is permitted on Car#2, 3, 5, 6 and 11. Meal is not included in the rate. And the reservation for dinner must be done by 23:00 on three days prior to the departure date. But simply you can make a reservation at the same time as booking for the room. You can choose Kaiseki Gozen (懐石御膳=Traditional Japanese style cuisine) or French four course. Japanese dinner is 5,500 yen. French course is 7,800 yen. And also you have to choose dinner time from 17:15-18:15 or 18:30-19:50 or 20:10-21:30. Dining car is the pub after 20:30. You don’t need to make a reservation. If you take Cassiopeia Suite or Cassiopeia Deluxe, Room service is available for only the first dining time, 17:15-18:15. And Also you can choose Cassiopeia Tokusei Bento (カシオペア特製弁当=Cassiopeia Special Dinner Box) at 3,500 yen. Of courese you need to order this dinner box three days before the boarding. You don’t need to make a reservation for the breakfast. They open at 06:30. They have Japanese style and Western style. Both breakfast are same price at 1,600 yen. They sell regular dinner box (Japanese Bento, Sandwich and so on) and drinks. If you cannot make a reservation for the dining car, you still can get something to eat. Of course you can get something before boarding. Lounge car is open for the public. You can enjoy the view through the panoramic glass windows. 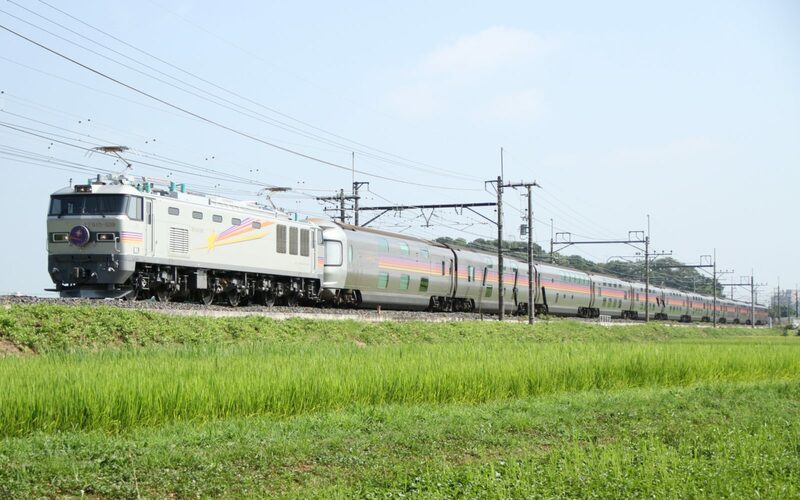 You can see the iamges of Dining car and Lounge car here on JR East website. And also smoking is not permitted in Lounge car, but it is permitted in and dining car. Please don’t upset that! *Since March 17, 2012, smoking is not permitted in both dining car and lounge car. It is very difficult for Japan Rail Pass user to make a booking. Because you cannot make a reservation online. All you can do is going to the station to take it. Japan Railway starts to sell the ticket 30 days prior to the departure date. Most of Japan Rail Pass user start to use the pass right after arrival. So if you have a plan to take this train, you need to think about the back up plan. You have to expect that you won’t be able to make it! *If you have a friend who speaks Japanese, you can ask to make a call to JR West odekake net at 078-341-7903. This reservation center can take a reservation for all JR trains. However you need to pay surcharge and accommodation fee. Japan Rail Pass do not cover any surcharge and accommodation fee on overnight trains. So it is not a big issue. And also you have to pick up your ticket in JR West, Shikoku or Kyushu’s stations. You cannot pick up ticket in other areas, like Tokyo, Niigata, Aomori, Hokkaido. But you can check the availability online. Please access this page on JR East website. It is in Japanese but it is not complicated. You will see like this table. From left to right, Month (月), Day (日), Week-day (曜日), Departure from Ueno (上野発), Departure from Sapporo (札幌発). So the second row means January 17, Monday. Cassiopeia is not operated from Ueno to Sapporo. So you see “-“. On the other hand, you see “O” from Sapporo. It means that lots of rooms are still available. Please see the sixth row. You see “△” departure from Ueno. It means almost sold out. If you see “X”, it means completely sold out. Please check in last minutes before you depart from your country. Operation dates will be different after March 14, 2015. Please find it at Schedule of 2015 spring seasonal trains of Japan Railways. I wrote the dates until September, 2015. But you need to think about alternative in case that you cannot make it. If you need any ideas about a back up plan, please refer the post, Alternatives of overnight train Cassiopeia and Hokutosei. I suggest several itineraries. Timetable will be different after March 14, 2015. Please find it at Schedule of 2015 spring seasonal trains of Japan Railways. I wrote the dates until September, 2015. Is there any overnight train from tokyo to hokkaido or sapporo on 8th august, 2018 and return on 10th august? is this train covered on the jr pass? Is overnight train operating on 21Mar late night from Haneda Internatinal Airport to Sapporo or Hokkaido? Flight arrival Haneda airport at 2205hrs. Overnight train to Hokkaido is no longer available. I am going to Tokyo at Nov 2016. Any overnight express train direct run from Tokyo to Sapporo.Please inform. Unfortunately there is no overnight train options any more. Is there a possibility for Cassiopeia to resume again in the future? It is very sad to learn that one of the best train service in the world is not available anymore. I just cannot get over it as I have not experienced this Japanese legacy. One thing I’d like to say, THANK YOU so much, Takeshi San. Without you, the discovery of Japan Rail would not be this great. You are a wonderful person. Thank you once again. Cassiopeia will run in this summer. But it’s not a scheduled train. It will run as packaged tour. We cannot purchase a ticket at the station. Only travel agent will sell this ticket. Of course we cannot purchase this tour from outside Japan. The fleet for Cassiopeia is still okay to run. It will run for next couple of years. But it will run for a group tour only unfortunately. Thank you very much for keeping me posted. However, may I ask another question, is there a possibility for Hokutosei or Twilight Express to become alive again? Those are completely retired. The fleets are too old. I am going to Japan December 2016. Does cassiopeia still operate? It look nice and I really hope I still can ride in this train. Please inform. Thank you. It might run. It was discontinued in this past March. But a few days ago, JR has made an announcement that Cassiopeia will return as group tour train. But the ticket may not be able to purchase at the station. You have to purchase it at travel agent. The detail info has not been released yet. But it will be super hard to book. If you are interested in that, you may ask the nearest Japanese travel agent. JR pass authorized agent may take care of it. But most of them do not take it. Someone said the Cassiopeia has in fact already stopped running (in September or October). That is to say, it will not continue to March 2016. Is that true..? I rode it once back in the 1990s, so I am sorry about that.